The United States Environmental Protection Agency (“EPA”) last week took steps to implement its national air quality standards for fine particulate matter that will affect airport development projects and ongoing environmental compliance. On Friday, December 17, 2004, EPA designated 225 counties as being in violation (known as “nonattainment”) of new outdoor air quality standards for fine particulate matter (particles with a diameter of 2.5 microns or less, or PM2.5). PM2.5 causes respiratory and other health effects and is primarily caused by combustion processes. The following figure shows those counties the EPA has designated as being nonattainment areas. Nonattainment status has the potential to significantly affect airport project development and compliance. State and local air agencies with jurisdiction over the areas designated as nonattainment areas will have to develop State Implementation Plan (“SIP”) provisions by February 2008 demonstrating how they will attain the new PM2.5 standard. Such SIPs are likely to include emissions budgets for PM2.5 and its precursors, new stationary source permit requirements and other requirements. In addition, federal actions in PM2.5 nonattainment areas will trigger the need to demonstrate conformity with the SIPs pursuant to the general conformity regulations under the Clean Air Act. EPA is expected to revise these general conformity regulations in 2005 to address PM2.5 issues and general concerns about the operation of the conformity requirements. Transportation conformity requirements also will apply to many highway and transit projects in PM2.5 nonattainment areas, which may affect some airport projects involving access roadways. 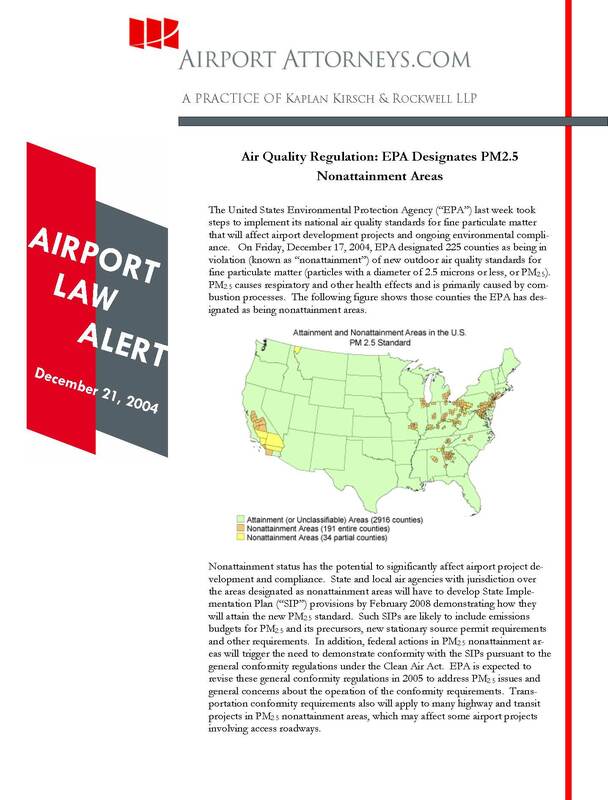 Airport proprietors located in the new nonattainment areas should closely follow and consider commenting on EPA rulemakings relating to the implementation of the PM2.5 standard. In addition, airports should consider expanding support for efforts by FAA, NASA and others to develop data and tools to better understand airport-related contributions to PM2.5. Inadequate data could complicate some airport conformity and other analyses. It is important for airports to also work with state/local air agencies and metropolitan planning organizations as soon as possible to educate them about the uniqueness of airport emissions and to secure a favorable treatment in upcoming SIPs and other plans. On December 16, 2004, the FAA published proposed revisions to FAA’s order guiding review of airport projects pursuant to the National Environmental Policy Act (“NEPA”). Draft Order 5050.4B revises and updates FAA’s badly outdated 1985 Airports Environmental Handbook (FAA Order 5050.4A). The publication of Draft Order 5050.4B follows FAA’s June 2004 publication of Order 1050.1E, which describes how environmental documents should be prepared for all FAA-approved projects. Draft Order 5050.4B supplements the general instructions in 1050.1E, with detailed guidance specific to airports. The Draft Order 5050.4B covers a number of subjects, including categorical exclusions, streamlining, mitigation obligation compliance, EIS planning responsibilities, wetlands, implementation of programs under the Vision 100 legislation (including streamlining), and Native American consultation. When the FAA finalizes the Order, it will provide critical guidance affecting the environmental review of FAA-approved actions relating to airports. Comments on the Draft Order are due by February 16, 2005. Airports are strongly encouraged to review the Draft Order and consider its implications for current or future airport projects. Airports should consider submitting comments to the FAA identifying areas of concern and supporting areas of improvement. In a ruling that comes as a huge relief to airports nationwide, the Supreme Court of Nevada recently overturned a $22 million condemnation award against a local government for imposing height limitations around its airport. In the case, County of Clark v. Hsu, landowners near Las Vegas’ McCarran International Airport sued Clark County, alleging that the county’s zoning height ordinances diminished the value of their property. The property was located in a “transition zone” near McCarran, where structures may not protrude above imaginary surfaces without a variance. Because the ordinance preserved airspace for aircraft operations, the landowners argued that it amounted to the taking of an avigation easement from them and a physical invasion of their property. In ruling in favor of the county, the Supreme Court found that an avigation easement is created only when low and frequent overflights cause a “direct and immediate interference” with the enjoyment of the property. The transition zones around McCarran did not create actual flight paths, the court found, but represented a reservation of airspace to allow aircraft maneuverability in emergencies or other special situations. The court noted that a zoning ordinance could, however, amount to a taking if it is overly restrictive. Because the property owners in Hsu had not yet proposed specific development plans, the Court observed that the County might grant a variance, so it was too early to determine whether such a taking had occurred. The Hsu decision provides strong support for height restrictions around airports. But at the same time, it also serves as a reminder of the need to ensure that restrictions do not excessively impair property owners’ reasonable expectations for development of their property. Airports that have worked with local governments to impose height restrictions to protect airport operations, or are considering doing so, should carefully tailor their regulations to minimize the risks of takings liability.